Main Street, U.S.A., at Magic Kingdom Park is one of my favorite areas in all of Walt Disney World Resort. I love the turn-of-the-century charm that exists in the architecture, the streetmosphere characters – and especially the live music. 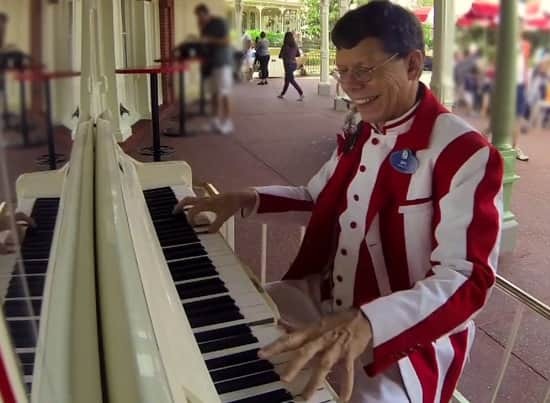 One of the individuals who helps take Main Street, U.S.A., back to the good ol’days is Piano Player Jim Omohundro, who has been playing the piano at the park for 30 years! (Today is actually his 30th anniversary!). Check out the video below to hear his thoughts on spending 30 years on Main Street, U.S.A. I remember on a visit 30 years ago I was chatting with Bub (Dapper Dan) and he mentioned there was a new piano player and we walked over to give a listen. Jim had only been playing about a week. Loved him then. Love him even more now! Happy anniversary Jim! We would always stop and see Jim play when I was growing up on our family’s annual Disney trips. Now that I am married and have kids of my own it is so great to be able to see him again with them now! Congrats on 30 years Jim, you are great and a true park fixture! Here’s to another 30 more! (But amazing that he’s been doing this for 30 years because he is truly ageless!!) We will hopefully see you in 2 weeks when we are there in December! I’ve got great memories of seeing Jim from the early 80s as a child. I can remember being at WDW with my parents and my grandparents, and my grandmother sitting at Casey’s and absolutely loving to hear and watch Jim play. She’s been gone for almost 10 years, but everytime we walk by Casey’s and see Jim, I always comment to my wife and kids how my grandmother loved Jim’s talent. Congratulations and thanks for the memories! It always make my family’s day when we make the turn at Casey’s Corner and see Jim playing there. We love visiting Jim at the Magic Kingdom! He is such an incredible performer and adds so much spirit to Main Street USA! Keep it up, Jim! Jim is an amazing performer. We were there for a week a couple of weeks ago. I kept looking for him but was sad to have missed him. I have video of one of our children dancing to his playing. Congratulations, Jim! Look on youtube for him… more incredible stuff! Happy Anniversary Jim! It’s cast members like you that make the Magic Kingdom so special! I am the mother and future mother-in-law of the newly-engaged dancing couple in this wonderful video! Jim’s first day on the job was the day that my husband and I flew to Disney World for our honeymoon in 1983 so it seems appropriate that our daughter would be in this tribute. She and her fiance were engaged a few days before this video on the train station platform overlooking Main Street. Her twin sister set aside time on each of our yearly visits to listen to Jim play and his interaction with her was always a highlight for our entire family. Thank you to Jim from the bottom of our hearts for 30 years of love and magic. Thanks for sharing your nice memories, Tracey! It’s not a Disney trip without listening to Jim at Casey’s. Thanks for creating all the wonderful magic! Main Street wouldn’t be the same without this. Congratulations on reaching such a milestone! I can’t wait to get back to hear the melodies again! 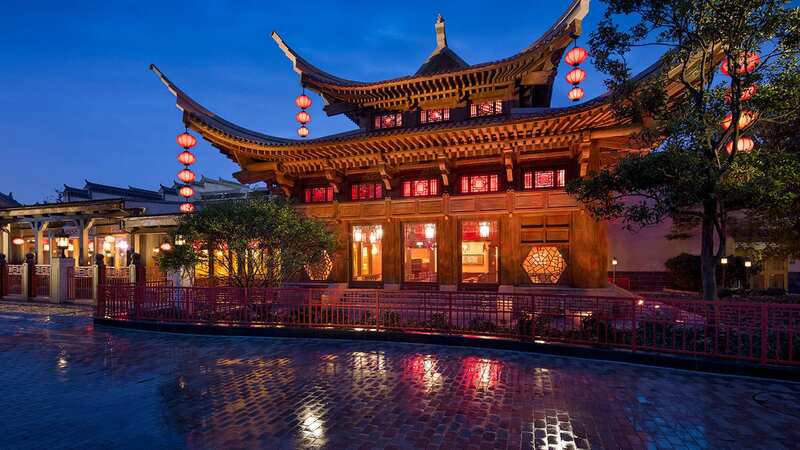 This epitomizes why we love Walt Disney World so much. You just can’t get the passion that the cast members have for the impact the make on their guests and the respect returned to them from their employer anywhere else! Great story and interview Jennifer. Thanks for sharing and thank you Jim for the memories! I love listening to Jim, he is a great performers and generous with his time, always willing to answer a question, and often will take requests, i’ve even recorder his playing on several trips and love to listen back to bring back the memories of my WDW visits. Congratulations on 30 years Jim! I am only 3 years behind Jim’s arrival at WDW. My first visit was in 1986. In January 2014, I will mark my 10 year anniversary as a part time Cast Member. In all those years, I have been delighted and charmed by Jim, and feel disappointed if I arrive on Main Street and he isn’t there. Some of my happiest Disney memories are of the times I have stopped by and sung a song with Jim. I hope he stays forever! And really, someone needs to think about naming him one of our Disney legends and/or installing a window at Casey’s for him. He has touched millions with his music and presence. Jim, I was just down there about three weeks ago! If I had known such a momentous milestone was coming for you, I would have congratulated you in person! Anyway– my heartiest congratulations from a former (and still wannabe) Walt Disney World Cast Member (Magic Kingdom Attractions) and my family! My younger son still remembers having a great talk with you about your musical talent and his ability to occasionally compose tunes. You certainly define the meaning of Disney Legend in my book! Thank you for the memories, the music, the chats and — of course– the Disney Magic! Here’s to another 30+ years! HAPPY ANNIVERSARY JIM! thanks for adding to the magic. love your playing! Being 31 years old we have stopped and watch Jim play EVERY time we go. (which is about every year since I was 1 lol) And if we don’t see him right away we get worried he isn’t there!! It’s is soo good to see him recognized and love by so many people. Happy Anniversary!! just a talented man. my wife ,jina & I dearly enjoy watching this man perform & he takes requests . so don’t be afraid to approach him & say hey jim can you play this for me . all the best jim you are one of the legends see you 1st week in December . We live in Central Florida so my children were regulars at the Magic Kingdom as they grew up(32,28,25,and 13). Our now 28 year old always wanted to stop and listen when he was little and started piano lessons when he was 8 because he wanted to play music like the man at Disney. He took 10 years of piano lessons because of Jim and although he is shy about playing for family he plays piano to relieve stress from his career in grocery store Management. Thank you Jim for the years of musical memories! Jim is definitely a favorite Cast Member of mine 🙂 We always stop to listen when we hear him playing at Casey’s. Our family has enjoyed many a performance over the past 20+ years that we’ve been visiting. Congratulations on your 30th year at WDW, Jim! 30 years… oh my god !!! Seems like yesterday, but yep, it is almost 30 years from when I had started on Main Street too…. THAT’S MY COUSIN!!! Great to see Jim getting a little attention…his dad (who was also an amazing musician) would be incredibly proud! I’ve gotten to see and hear Jim play a couple times at Casey’s…always a pleasure.